An Anchor retirement scheme in Merseyside is about to see one of its residents become an overnight star. However, the star is not one of its 40 odd ladies or gentlemen living there…but the resident cat - Charlie. Last year, Charlie was hit by a car and left for dead but brought back to life by local animal charity in nearby Huyton, PDSA. Karon Claeys, Scheme Manager of Bold Manor in Dragon Lane, was the one who found him. ‘I was on my way to an Anchor meeting when I saw poor old Charlie had been knocked over by a car in our own car park. We immediately alerted the owner Linda Rivington and between us brought him to the local vet. 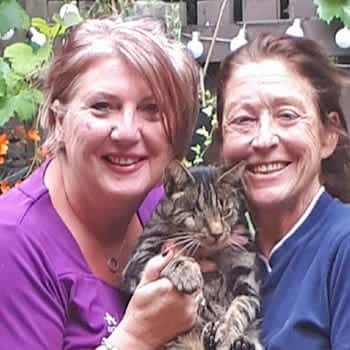 He was then transferred to PDSA who performed multiple operations on him bringing him back to life and made Linda as happy as I ever seen her. It was while Charlie was at PDSA that a Channel 4 team were filming a series called ‘The People’s Vet’ and thought Charlie would make for a great subject. His entire recuperation was filmed and will be shown as part of the six part series starting this week. And just to really add to his ego, Charlie will become the face of PDSA when they begin a year-long advertising campaign. Charlie’s owner Linda said: ‘I just want to say what a fantastic organisation the PDSA is. I cannot put it into words how they obviously helped Charlie, but I was so upset at the time and they were unbelievably honest and truthful right from the start and helped me lift my spirits through those terrible days’. Back to Karon again: ‘It is amazing how things like this can bring people together. First of all Charlie is near death, then he is patched up and loses the sight of one eye and starts bumping into all the furniture, and now a year later Charlie has been adopted as the scheme’s pet. Everyone here knows him, whether he is sleeping in the lounge or jumping up on my desk, always looking for attention. The People’s Vet, begins this Saturday 4 August at 4.30pm on Channel 4.